On the left, you see a tubeworm with its feathery feeding appendages extended. 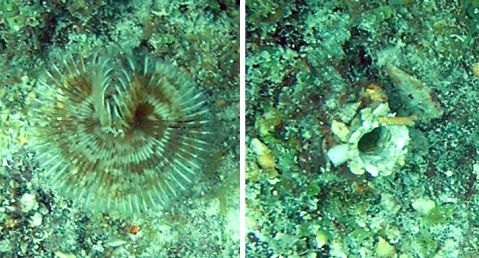 On the right, the tubeworm has retracted those appendages, and you see only the opening of its tube. When I scuba dive, I love finding tubeworms like the one pictured above. As adults, these worms build tubes made out of calcium carbonate to house their delicate bodies. They feed by extending feathery appendages called radioles, which catch nutrients that are floating in the water. On the left side of the picture above, you see a tubeworm with its radioles extended. However, if you scare a tubeworm (I do so by flicking my fingers at it), the worm will pull its radioles back into its tube for protection. At that point, you see only the opening of the tube, which is shown on the right side of the picture above. An adult tubeworm spends its life attached to a hard surface, such as a piece of coral, a rock, or even the hull of a ship. 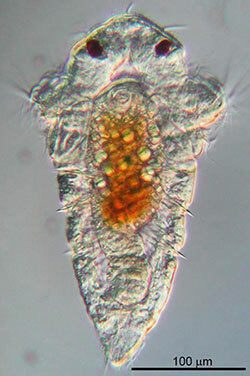 However, when a tubeworm egg hatches, the larva that emerges is free-swiming and looks nothing like the adult. In order to mature, it must find a surface to which it can attach itself. It has long been known that tubeworm larvae tend to attach themselves to surfaces that contain specific bacteria, but no one understood how the larvae know where the bacteria are. Nicholas J. Shikuma and his colleagues have done a study that helps us understand this amazing process. They concentrated on a specific species of tubeworm, Hydroides elegans, which is a common nuisance because it tends to stick to the hulls of ships (that’s not the species pictured above). They already knew that these tubeworms tend to settle where a specific bacterium, Pseudoalteromonas luteoviolacea, is found. As a result, they studied the bacterium in detail, and they found something rather incredible. Upon further investigation, they found that about 2% of the individuals in a bacterial colony produce these structures. The individuals will fill themselves with the structures and then break open, releasing hundreds of them. Those structures then form a net, and when the larva of a tubeworm hits the net, it chooses to settle down there. The researchers don’t know why the bacteria do this, and they don’t know of any benefit that the tubeworms give to the bacteria. Nevertheless, it does seem clear that the bacteria purposefully lay down these tubeworm-catching nets. Indeed, 2% of the population dies in order to make them! I find these results fascinating because prior to this study, it was thought that the structures which make these nets were produced by bacteria only to harm others. However, we now know that they are also used to help a completely different species. It makes me wonder if this is one example of how the Fall affected nature. Could it be that these structures were initially designed to help out tubeworms so their larvae would know where to land? Could it be that after the Fall, those same structures were adapted to also cause harm? I hope these results encourage more research into the complex relationship between bacteria and tubeworms. I suspect that the reason the bacteria lay out “welcome mats” for tubeworms is because they live in a mutually-beneficial relationship with one another. I have written several articles about how organisms of different species work together in order to survive (see here, here, here, here, here, and here for example), and I think it is one of the most interesting aspects of nature. Evolved “true” altruistic behavior among non-relatives in non-social animals. What I mean by “true” altruistic behavior is the observation of an individual sacrificing its reproductive output for the benefit of individuals to which it is either unrelated or from whom it does not expect to receive return benefits. In this “true” altruism your genes give benefits to others and get nothing back, and this shouldn’t evolve under natural selection. And, indeed, we don’t see such altruism in nature. But of course if the bacteria benefit, this situation doesn’t qualify. Whether this represents an instance of altruistic behavior that facilitates group selection, or a neutral lytic event with a set frequency remains to be determined. Although MAC production is beneficial for tubeworm larvae by inducing metamorphosis, it is currently unclear how larval settlement and metamorphosis might benefit the bacterium. It is equally possible that MACs evolved for a completely different purpose. However, I doubt that Jerry Coyne would ever accept that any behavior in nature is truly altruistic. He can always come up with some elaborate story as to why an “apparently” altruistic behavior is not really altruistic. Indeed, he spends a lot of time making up elaborate stories to get around the data. As for what benefit it might give the bacteria, perhaps the bacteria feed on or otherwise benefit from materials discarded by the worm, either in the construction of the tubes or in excreting indigestible substances that are caught in the radioles. They might also simply make it easier for the bacteria to stay on the substrate by proving shelter from currents or altering the substrate in some subtle way. If there was no death before the fall, would the bacteria have had another way of creating the net, other than killing 2% of the population? David, most young-earth creationists think there was no animal death before the Fall. In that scenario, bacterial deaths, protozoan deaths, and plant deaths happened before the Fall. I honestly don’t think the Bible tells us there was no animal death before the Fall. The only thing we know for certain is that there was no human death before the Fall.